The chapters will be concluded in the directions of the future works in general. In addition, some of the important factors for the further studies will be extracted and argued on the views of mechanisms and connections. Also, some of the important augmented groups of neurons will be picked up and then introduced with future studies, especially on brand new functions and mechanisms. Moreover, as related matters, some of the concepts (for example, good, bad, like, dislike, love, affection, reflection, etc.) will be introduced for further study. Finally, the human brain will be wrapped up for further study. Firstly, all over the chapters are wrapped up. From the past of 17th century or from the Greek time, the idea of an autonomous machine was started to be brought about a new thought out. Since then, this idea has been evolutionary grown up through pure research; Control → Automatic Control → Intelligent System → Knowledge Base → Dynamic Knowledge Base → Initial AI → Cloud → AI (in General) → Human Like AI → Consciousness (under Studies). 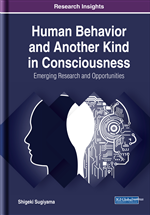 And then, the current researches are going further to study consciousness for the goal of the implementation to a mimicked system of human. These flows of the histories are described in the chapters 1 through 10. Also, in the final chapter 11, the most important further studies’ matters, subjects, and words are considered briefly. First person in the mechanisms and the connections. This comes up as a real entity in the brain. Also, it, itself, will be able to grow by the stimulations from the outside world. So, it is very important to know the mechanisms of the growing and the whole connections for the growing. Second person in the mechanisms and the connections. This comes up in the prefrontal cortex as an artificial entity (a virtual entity). Also it, itself, will be able to grow by the stimulations from the outside world. So, it is very important to know the mechanisms of the growing and the whole connections for the growing. What are the key and the core terms of groups of neurons? Groups of neurons will be possible to contain the abstracted concept (for example; good, bad, like, dislike, love, affection, reflection, etc.). Those are kinds of artificial entities? Or what? What is love? How is it created? And how is it matured? What are the mechanism and the connection in the prefrontal cortex? If the group of neurons in a child’s prefrontal cortex of brain that are only positively responding (positive; good matters, hurt nothings, do things without rewards, giving matters to anybody, voluntarily intentions, etc. which will be cored somewhere in the prefrontal cortex), will it become a kind of artificial entity? What is concurrency? How can the concurrency space be made at the place where the five senses and the neurons information from the cerebellum will be meeting in the computer system? What is abstract in a sense of neurons’ activities? What is reflection? What sorts of meanings does brain have? What is reflection in a sense of neuron mechanisms? What is reflection in a sense of neuron processing? The neuron information which flows from the cerebellum will move into the prefrontal cortex. Is there any definite key mechanism which the neuron information flow moves to under this flow route? This is related with reflection process.